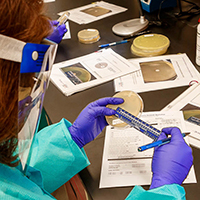 Members of Wadsworth Center’s Bacteriology Laboratory, along with a guest lecturer from the CDC, provided a 2-day classroom and hands-on workshop in culture, susceptibility and DNA detection of antibiotic resistant bacteria for 12 laboratory professionals from 7 state public health laboratories. Training was made possible by a $1.8 million grant received September 2016, which designated Wadsworth Center as a regional laboratory in the Antimicrobial Resistance (AR) Lab Network - one of seven in the country. As its name implies, the network relies on the connections between the trainees and the trainers. Increasing laboratory capacity to test and characterize these public health threats will allow laboratories to enhance efforts for monitoring resistance trends, detecting emerging resistance, and informing strategies for preventing transmission of these infections. Each of the seven regional laboratories in the network performs certain “core” functions for all the states in their region. One of these activities is to test for carbapenem-resistant Enterobacteriaceae (CRE), which the CDC has designated an Urgent Threat, the highest threat level, because they are resistant to all or nearly all antibiotics. The Bacteriology Laboratory also provides testing for several organisms that belong to the Serious Threat list, like vancomycin-resistant Enterococcus sp. (VRE), vancomycin-resistant Staphylococcus aureus (VRSA) and methicillin-resistant Staphylococcus aureus (MRSA), which are healthcare-associated infections. Finally, they will procure samples for the national AR Isolate Bank, a repository of specimens of interest, with the purpose of further study, including whole genome sequencing. In addition to these core functions, Wadsworth Center has the special distinction of being one of only four laboratories in the country to perform susceptibility testing for Candida species, an emerging fungal pathogen. The Mycology Laboratory identified some of the first Candida auris-positive specimens in the country. The Antimicrobial Resistance Lab Network is actually just one of the 34 projects that make up the broader Antibiotic Resistance Solutions Initiative, a $14 million program funded by CDC to combat resistance on all fronts.